As the crow flies, the closest restaurant to where I live is 'My Kitchen' a vegetarian restaurant on the Leigh Road, a mere 5 minute amble away. But, being a rampant carnivore, I've dismissed it out of hand. Don't get me wrong, I've admired the look of the place while tramping past on some errand or other, but Vegetarian to me says bearded, threadbare jumper wearing, lentil munching devotees to the mung bean. Keep your Nut Cutlets, I'm sure your Tofu burger is very tasty indeed....Not for me thank you. Lately reports have been filtering back to me that the food in 'My Kitchen' is excellent, snippets of Halloumi this and Pan fried potato this have caught my interest. Enough is enough, I just had to try this for myself. And, I'm happy to report - I was very wrong. In fact, My Kitchen is the best local restaurant I've eaten in by a long chalk. 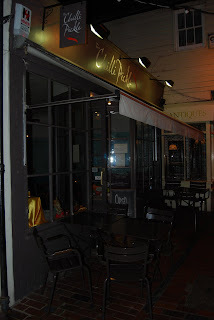 Inventive and impressively cooked food in a relaxed almost Parisian Bistro like environment - and incredibly good value for money. Hallelujah - I'm a convert!!! 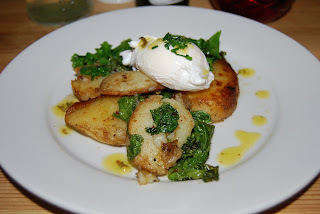 To start, Sauteed Potatoes, and Kale with a Poached Duck Egg. A simple dish, but extremely tasty and well cooked. I Can't fault this, beautifully cooked potatoes with lightly cooked crisp Kale and a rich creamy yolked duck egg. Lovely stuff. Onto the Mains, Porcini and Cup Mushroom Risotto with roast Garlic and Parmesan. 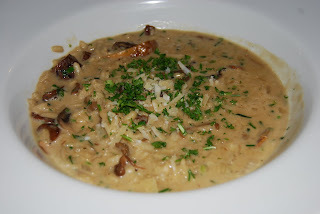 Another cracking dish, very rich and a huge portion to boot - perhaps a bit too much cooking liqueur, my preference for risottos normally being slightly thicker and stickier but as it was so tasty I can't complain too much. I cleared the plate. The Girlfriend, who had started eating her starter of Almond Pesto, Mozzarella, Olive and Rocket Salad before I could get a decent photo (When will she learn eh?) was extremely happy, and was almost delirious when the dish above arrived as her main course. 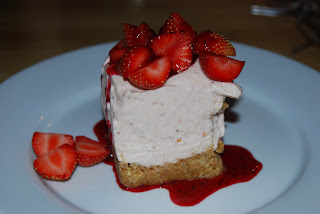 I decided to share a dessert with the GF, opting for Strawberry Cheesecake. Once again, a huge portion so easily enough to share. Wow, I've eaten a lot of cheesecakes over the years and this was a really good example, rich, full of flavour and creamy. So, two courses each, a dessert to share, a glass of wine, two beers.....£40!! That's right, you heard correctly, I'll say it again - £40! Incredible value, and extremely good food. If this rampant carnivore can come away impressed, believe me - they're doing something very right. Highly recommended. What I've been cooking - August. 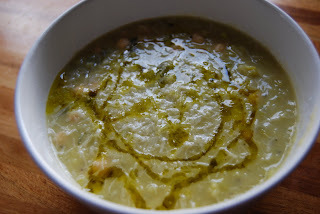 Time for a monthly round up of the more interesting stuff I've cooked in the last few weeks. This month, I've been cooking a lot from the Ottolenghi recipe book. Almost exclusively in fact! and once again I urge you to buy it if you don't own it already. It's full of excellent and unusual recipes with taste combinations that just have to be tried. It's destined to be a classic - so pick it up. Now, strangely enough, despite this stellar recommendation, the least successful recipe of this bunch is from the Ottolenghi book - and despite this dubious tag, it was still bloody nice, so I think that says something about the quality of the recipes (or possibly my incapability of following them! 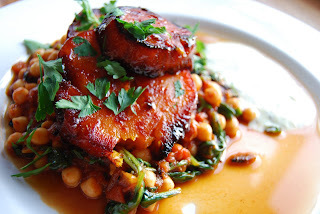 )...anyway in the photo above we have Chickpeas and spinach with honeyed sweet potato. Not a lot to say about this dish really, it was nice and filling, but cooking it I got a bit hot and flustered, almost burnt the shallots and then almost burnt the sweet potato - perhaps this coloured my view of the recipe. I just didn't enjoy cooking it? 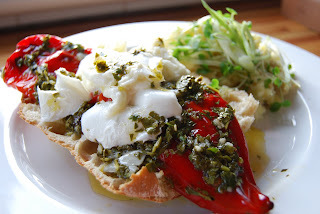 Next we have a cracking Ottolenghi dish,...two dishes in fact - Marinated Romano Peppers with Buffalo Mozzarella combined with Crushed New Potatoes with horseradish and Sorrel. This is a record breaker, awarded a massive 9.5 out of 10 by the Girlfriend using our....ahem.... highly scientific scoring system. Strangely enough, it's also one of the simplest things I've cooked. Romano Peppers are baked for 12-15 minutes in the oven, and then marinated in chopped coriander, parsley, garlic, cider vinegar and olive oil for two hours. This is then served with the ripped up Mozzarella. I added some toasted ciabatta and the Crushed New Potato dish (Which incidentally is also great), to bulk it out. (I'm a growing boy) Very nice indeed, light, fresh and very tasty. I'll be cooking this again. The final dish from the Ottolenghi recipe book I cooked this month was Roasted Butternut Squash with Burnt Aubergine and Pomegranate Molasses. This dish was recommended to me by Helen at FoodStories. (Thanks!) 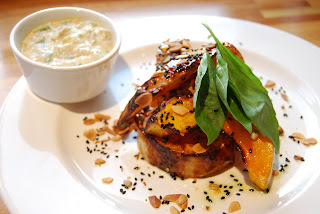 The star of this dish is the burnt aubergine and molasses sauce. An Incredible, smoky tasting sweet and sour sauce that goes perfectly with the roasted Squash. The preparation of the aubergine is quite a lot of fun as well, bringing out the inner pyromaniac in everyone. You basically burn the aubergine on the hob for about 15 mins, before finally scooping out the insides to make the sauce. Great stuff. Now for a couple of dishes I've cooked in August that believe it or not aren't from the Ottolenghi cookbook! 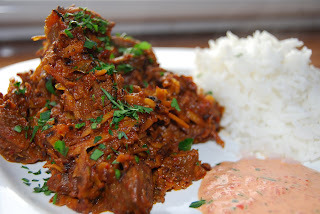 We have Beef Rendang, an authentic Malaysian recipe given to my by Liz at Gastronomy Domine. (Who I might add, subsequently, spent quite a lot of her no doubt valuable time answering my dumb questions on the ingredients. Thanks again Liz!). This was gorgeous and meaty, having a strong coconut flavour. But, the mission I had getting the ingredients! I think I've been in every Asian grocery and wholesaler in Essex AND Brighton. Could I find the required Malaysian Chillis? No!! In the end I used red chillis and some roasted red peppers to add a touch of sweetness (I couldn't lay my hands on dried red peppers either). This recipe is also notable for being the first time I've ever prepared a real coconut - which I might add has damaged my chopping board. Was it worth it? Yes. Finally we have a very simple soup, it's a recipe from the first Jamie Oliver book 'The Naked Chef' (which strangely I only recently purchased - having owned his subsequent recipe books for years) It's Chickpea and Leek soup and, it's nice, cheap and quick to make (almost knocking Chilli and rice off the top of my credit crunch budget dishes). I made this using homemade Chicken Stock.....I also used two tins of ready cooked chickpeas for speed (rather than soaking the chickpeas overnight, as specified in the recipe). warm these up in a saucepan for 5 Mins or so and drain. At the same time, peel and slice a medium potato, boil in salted water for around 12 Mins. Chop 5 Leeks and slice 2 cloves of Garlic and sweat in Large saucepan with butter and olive oil and a pinch of salt until tender. Add the drained chickpeas and potato to the leeks, cook for 1 minute. Add 850ml of Chicken or Vegetable stock, and simmer for 15 Mins. (I also added a Parmesan Rind for added flavour - I save them in the freezer. Fish it out, and bin it at the end of cooking - Thanks to fellow blogger Graphic Foodie for that great tip). Ladle half of the soup into a blender and puree it, returning to the pan with the chunky half. Taste and season well, serve with grated Parmesan and a drizzle of extra virgin olive oil. Lovely and simple, with some crusty bread this recipe makes enough for two dinners for two people. Essex Eating in Brighton - The Ginger Fox. I'd booked a table at The Ginger Fox for a late dinner on the way home from our couple of days in Brighton. It's a Gastro Pub, owned by the Gingerman group, who also run the rather excellent Ginger Pig in Hove, which I raved about here. The Ginger Fox is located about 15 mins drive outside of Brighton, a mile off the motorway, and a short way down some country lanes. 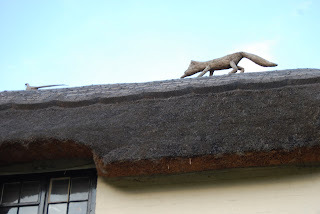 Pulling into the car park in the early evening sun, the pub presented a rather picturesque scene - with the thatched roof, incorporating a fox chasing a game bird, and the building overlooking some lovely countryside. The tables outside looked perfect for a lazy afternoon drink. Entering the pub, we proceeded to the bar and enquired after our table, slight hitch - my reservation had disappeared, but luckily for me - there was a table for two available so no harm done. After nibbling on some rather nice bread, I ordered Braised Pig Cheek Ravioli, with Gooseberries and Braising juices to start. 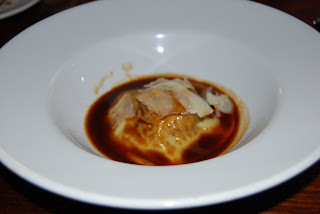 The ravioli was nicely cooked, the pigs cheek contents strong and meaty tasting, but not entirely sure it worked with the gooseberries, the sourness of the fruit not being balanced with any sweetness, but all the same it was pretty good. The GF declined to order a starter, as is often her crazy custom. 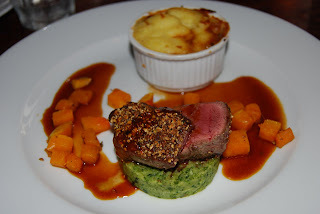 Onto the mains, I ordered off the chalked board of specials, Pumpkin seed crusted loin of Venison with Gamekeepers Pie, and Courgette puree. This was an altogether more successful dish, The Venison nicely seared, served moist and pink, the gamekeepers pie containing more tasty offerings of venison in a rich gravy, not entirely sure about the courgette puree - it looked nice, but didn't add a lot to the dish - although, I'm not the biggest courgette fan. But overall, very nice indeed. The GF ordered Roast Butternut Squash with Blue Cheese and Watercress Lasagna. There's no photo of this because a) she stuck her fork in before I could get a photo, and b) Lasagna isn't the most photogenic dish anyway. In any case, her considered opinion is that it was just OK, not bad - but not good either. I tried a bit and wasn't sold on it either. Onto desserts, and these were a lot more like it. 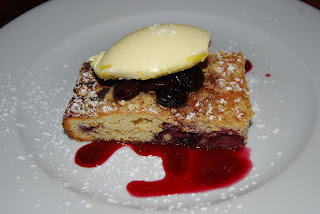 I ordered Cherry Oat Cake with clotted cream, and it was a winner, warm, moist and sweet with juicy cherries layered throughout. Great stuff. 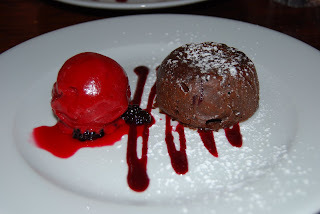 The GF chose hot Chocolate Fondant with Blackberry sorbet, and once again, it was really nice. I've eaten a fair few fondants and made them myself fairly regularly, (Recipe Here) and this was a good example, being baked lightly on the outside, but molten chocolate within. Paired with the rather good Blackberry sorbet, it was a nice way to finish the meal. So, the verdict. Pretty Good. I would visit again if I was visiting Brighton or the Downs as its perfectly placed to pop in on the way back, being just off the motorway to London. 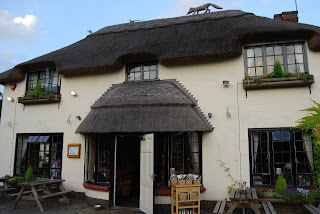 It's also a lovely example of a gastro pub, the food is interesting, some dishes working better than others. The thing is, I wanted to like it more, I had such a great meal at it's sister restaurant, the Ginger Pig in Hove back in February and was really looking forward to eating there. Perhaps I built it up too much in expectation, perhaps on the night I didn't choose the best dishes, but in the end The Ginger Fox was good, just not as good as The Ginger Pig. Essex Eating in Brighton - Chilli Pickle. Last week saw myself and the GF spend a couple of days in Brighton. As is usual for me, I had planned where to eat beforehand, enlisting the help of fellow Food Blogger, Brighton based Graphic Foodie, who had highly recommended Chilli Pickle, which is located in The Lanes, so on our first night that's where we headed first. But let's rewind a little. If you've never visited Brighton, The Lanes where Chilli Pickle is located are an ancient maze of streets and alleyways, packed full with small independent shops. Luckily Graphic Foodie had warned me that unless I knew the area well I should allow some time to find the restaurant. Bearing this in mind, I decided to scout out the exact location during the day, cunning and sly as I am. I walked around and around, I couldn't find it at all....."But this IS Meeting House Lane?!!!" I muttered darkly turning the map and studying it closely for the umpteenth time. Finally, after resorting to randomly plunging off down alleyways - I stumbled across Chilli Pickle, Success!....taking careful notes of surrounding landmarks I vowed to return directly later that evening. So, with a spring in my step, a Peroni or two sloshing around in my belly and the GF in tow I strode confidently through the balmy evening in Brighton - plunging into the lanes like a man who knows exactly where he's going, I headed for Chilli Pickle like a heat-seeking missile. Stepping up to the entrance, no problem at all. Time spent in planning is rarely wasted, as they say. Sitting down at our table, we surveyed the restaurant and very pleasant it was too. Low lighting, modern, extremely busy and buzzing...all good signs. We ordered some Poppadoms to eat as we studied the menu, these come in two varieties Dry Roasted or Fried, the former being quite spicy. 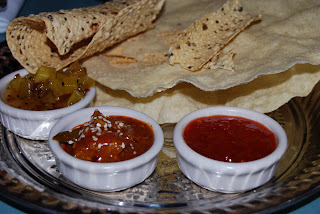 These arrived with a selection of pickles and chutneys.....but any similarity with whats on offer at your run of the mill Indian Restaurant ends there - these chutneys and dips were all freshly made and tasted fantastic. For starters I ordered the Veg Kadak Kebab, which are spicy vegetable dumplings with melted cheese and a roast tomato and ginger concasse on the side. 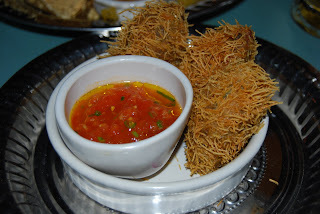 These were lovely, with a really unusual texture - almost like deep fried shredded wheat! (probably doing the Chef's a complete disservice with that description) But, they were lovely. 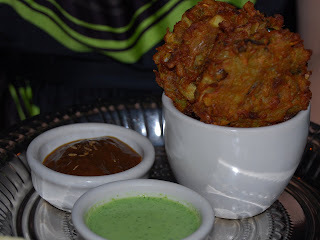 The GF ordered Aubergine and Potato Pakora, which the menu describes as crispy fritters. 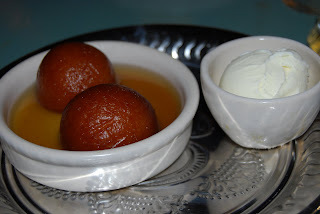 These came with two chutneys, tamarind and mint. She really liked these, I had taste and I liked them as well. Combined with the dips, a couple of really nice starters. But, it was the Mains I was really looking forward to. I'd heard previously about the Award Winning Oxtail Madras, and couldn't wait to try it. 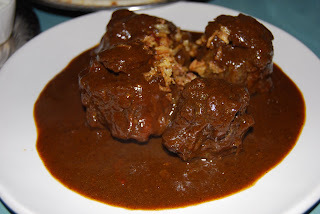 The Menu description describes this dish thus "Sussex Oxtail pieces gently braised in a spiced rich gravy served with cumin pilau and spring onion riata." Slightly perturbed by the 4 red chilli symbols next to its entry on the menu, signifying pretty damn hot - I stuck out my chest, Man'd-up and ordered it anyway. It arrived and I tucked in with gusto. Wow. Spicy! but nice....so nice in fact that I discarded knife and fork and picked each piece of Oxtail up in my hands, biting, slurping and gnawing every single piece of meat off the bone. A Vulture couldn't have done a better job. Delicious - really good stuff - but phew - hot. Meanwhile, at the other end of the table looking at my performance with the Oxtail aghast, my GF was eating Paneer Tikka Masala in a somewhat more refined manner. 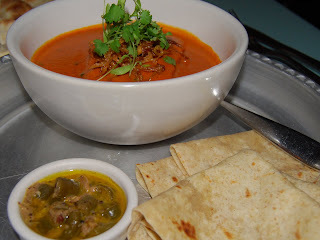 The menu describes this dish as "Indian cheese tandoor baked, served in a Tikka Masala sauce with green chilli pickles and chapattis" - It's heat quota is denoted by a solitary chilli - so fairly tame then. She really liked this, again - I had a taste (taking a break between picking at oxtail bones) and thought it was pretty nice, not as nice as my dish. But good. 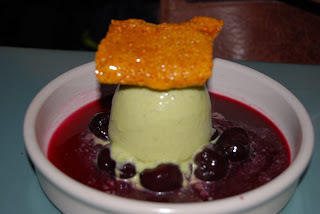 The GF picked the winner here, Pistachio Kulfi with cherry compote and honeycomb. Honestly, this was incredible. Really simple dish, but the flavours went together so well. She was really impressed with this, as was I - when I managed to get my spoon in there and steal a little taste. Oh - a word about the drinks. As befitting this excellent contemporary Indian Restaurant Chilli Pickle stock a very impressive list of quality lagers, including stock from the Meantime Brewery in Greenwich to various German wheat beers. 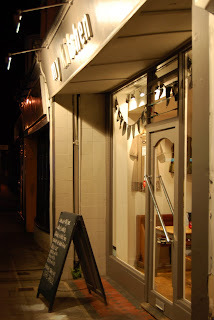 Overall - We had a first class evening, the food was really excellent, the staff friendly and brisk and it was fantastic value at around £60. Bargain. So thanks again to Graphic Foodie for the recommendation, and now I'm passing on the recommendation to you....with bells on. When your next in Brighton eat here. Eating from Ottolenghi - The Cookbook. A few months back, fellow blogger Gourmet Chick heaped much praise on the Ottolenghi cookbook, going so far as to make the claim it was the best recipe book she'd bought all year. To my shame, I'd never heard of Ottolenghi and never visited any of the four London Ottolenghi Deli/Restaurants. But, based on this recommendation, I bought the book, and what an excellent decision that was. Thanks Gourmet Chick! A little bit of information about the author, London based Yotam Ottolenghi working in partnership with fellow Chef Sami Tamimi creates food inspired by their native West and East Jerusalem upbringings, but with wide ranging influences from Persian to Californian....to sum it all up in a nutshell it's Middle Eastern with a contemporary twist. Last week, as it's (allegedly) Summer, and remembering that the book was stuffed with unusual salad type recipes, I got the book off the shelf for another look. Found a likely looking recipe, cooked it - fantastic stuff, gaining an almost unprecedented 9/10 from the Girlfriend on the patented scoring chart. Heartened by this success, later in the week, I cooked something else - also fantastic, also scoring 9/10 from the GF. Now in an almost frenzied, ecstatic, state of delirium at this unheard of success I cooked something else.....the crowd fell silent in expectation.....it was good...the crowd erupted, 9/10 - this is incredible! much back slapping and cheesy grins all round. That's right - three winners in a row. Believe me, with the GF's discerning tastes, I'd have better odds of winning the lottery. So, what did I cook to produce all this glory? 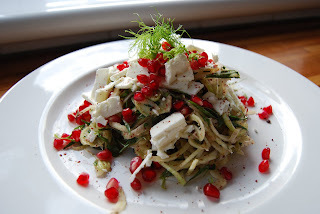 First up, we have 'Fennel and Feta with Pomegranate Seeds and Sumac'. This is basically a salad of very thinly sliced Fennel, mixed with olive oil, sumac, lemon juice, tarragon and parsley layered with Feta Cheese and sprinkled with Pomegranate seeds. Amazing stuff. The Fennel, Lemon Juice and Sumac are obviously sour, the Feta Salty, the Pomegranate seeds cut through it all with a sweetness...very sophisticated indeed. Loved it - and it looks amazing if I do say so myself. Next we have 'Puy Lentils with Sour Cherries, Bacon and Gorgonzola'. 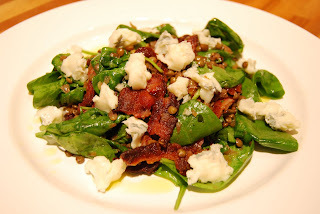 This dish contains another elegant pairing of unusual flavours and taste combinations, consisting of earthy Puy Lentils, sweet fried shallots, Sour Cherries, Salty crumbled Bacon, Creamy Gorgonzola cheese and the freshness of Baby Spinach. Unbelievably good. Finally we have 'Turkey and Sweetcorn Meatballs with Roasted Pepper Sauce'. 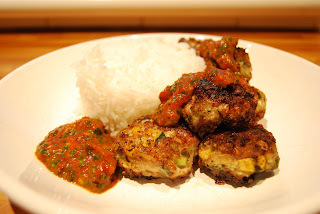 This was very easy to make, and once again tasted incredible...the roasted pepper sauce was smoky and piquant being spiked with both Chilli and Sweet Chilli sauce, a perfect partner for the meatballs consisting of Turkey Mince, Sweetcorn and Spring onions. The other plus about this dish was - it's cheap! Turkey mince is incredibly inexpensive - I added some rice as well to bulk it out a bit and to mop up the sauce, and we ate this for two nights. Bargain. As I mentioned earlier, the flavour combinations are intelligent, subtle and unusual. After trying the food you honestly come away with the firm impression that Ottolenghi is a genius. Three 9/10 scores in a row from the GF prove it! In summary - if you don't already own the Ottolenghi recipe book, beg steal or borrow it! 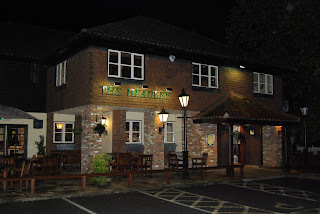 The Headley - Brentwood, Essex. 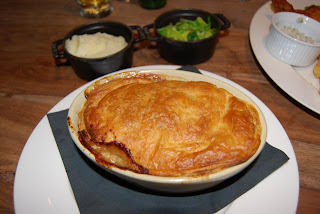 A fellow Essex based blogger, FoodUrchin mentioned The Headley in Brentwood last week. I'd never heard of it and was intrigued for a couple of reasons. First, The Headley is owned by the Chef Daniel Clifford, a two Michelin starred Chef. (His Michelin starred restaurant is in Cambridge - Midsummer House). And secondly, It's a Gastro Pub where the menu consists of seasonal, Traditional British food - which is exactly what I like to see, in fact you don't see enough of it. I love to see British produce and dishes cooked well. I just had to sample this, and booked a table the first chance I could. Last night, my cars headlights briefly lit up the exterior of The Headley through the torrential rain as I pulled into the car park. First thought, It's a pleasant looking pub. Hurrying inside, to avoid the downpour, the interior was also very nice - battered, comfy leather sofas and tables to the left a Bar ahead, high ceilings, very light and airy, the heavy wooden furniture evident all appearing to have a Chicken motif carved into it - nice touch . After a bit of an initial wait, we were told our table would be five minutes - we were shown to one of the comfy sofas and our drinks order was taken and brought over. After the briefest of waits we were shown to our table and got our first look at the menu. 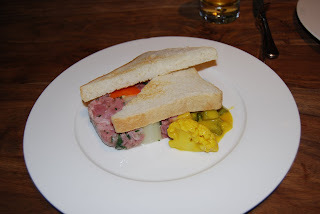 I went for a starter of Ham Hock Terrine with homemade piccalilli on warm toast. 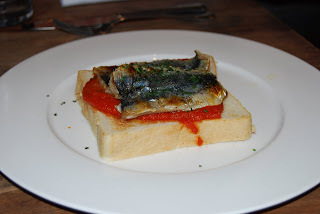 The GF went for North Atlantic Sardines on toast with a rich tomato sauce. My starter was great, the Ham Hock terrine being a really generous slab, thick and meaty - very tasty. The homemade Piccalilli was a nice touch, and stood head and shoulders above it's shop bought brethren. The only problem with this dish for me is that the toast was barely toasted. Perhaps that's the way it's meant to be? Not entirely sure. Overall the starter was a winner, barely toasted bread or not. My GF's starter on the other hand, North Atlantic Sardines - stank, but in a good way I'm sure. I'm not a fan of oily fish at all, the smell was incredible but she tucked in with gusto, again I think the toast could have done with being a bit more errr...toasted. Nevertheless, she seemed to enjoy it. Onto the Mains. I ordered a Steak, Guinness and Onion Pie with a Horseradish crust, with some mashed potato and sauteed spring greens on the side. The pie was lovely, first rate. To be honest I couldn't taste the horseradish in the crust at all, but it was large, tasty, hot and full of steak in the rich Guinness sauce. So, no complaints here. The side order of Mash on the other hand seemed to have left the kitchen with no seasoning at all. None. I can only surmise it was overlooked as I cant believe they'd send out something so bland. 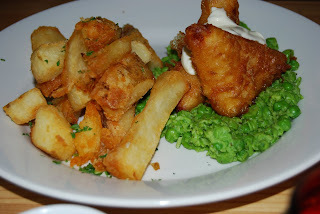 The GF's main of Beer Battered Cod and Chips with Sauce Tartar and crushed peas was extremely well cooked. The Batter was perfectly crisp, the Fish extremely tasty. 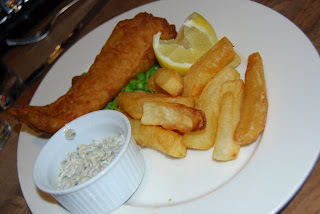 The Tartar sauce was obviously homemade and was very good indeed. The chips on the side were also cooked perfectly crisp, very hard to fault this dish. Perfect Pub grub. Studying the Dessert menu, unable to choose I asked the waitress what her favourite was, "As she'd obviously tried them all". I like to pose this question, it normally pays dividends as the staff have indeed tried them all and 'mostly' steer you towards the better dishes. Occasionally they have no opinion, which I find amazing and is normally just another milestone in a meal with awful service. But on this occasion, I was trumped. It was the friendly Waitresses first night, she hadn't tried any of them but speculated that sticky toffee pudding had appeared to be popular. Seeing as I was leaning towards the sticky toffee pudding option anyway, I didn't need much persuading. (Honestly, If it's got toffee, syrup or treacle in it - I'm ordering it without fail). 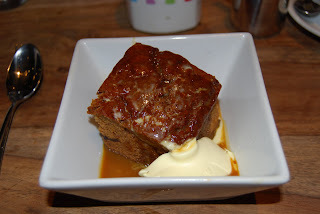 And it was good, very light, an unusual spiciness which I think was cumin - the only problem was the miserly amount of toffee sauce offered, and the equally miserly portion of clotted cream. I speculate as it was last knockings, I got what was left. Despite this, it was pretty good - not the best Ive eaten by a long chalk, but competent. Overall I enjoyed my meal at The Headley, and will visit again. Service was friendly and pretty fast. The prices are extremely reasonable, (Total cost of Meal for two, not including drinks - £40) the Menu extols exactly the traditional British food that I want to see in a Gastro Pub. It's a shame that the small details kind of let the side down, the un-toasted 'toast', completely unseasoned mash, the miserly portions of toffee and clotted cream with the pudding, but these are fairly minor quibbles, maybe they were having a bit of an 'off night' in the kitchen- it didn't really spoil my enjoyment of the meal, being more surprised by the 'misses' as most aspects of the meal were 'hits'. With a bit more attention to detail this place could be incredible.